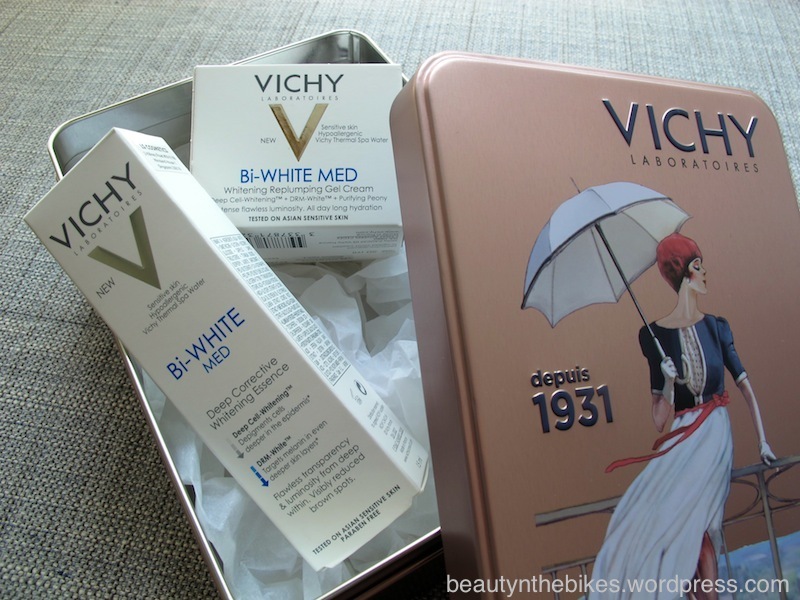 Vichy Bi-White Med: Getting A Clear, Bright Complexion Even With Sensitive Skin | beauty. bikes. As a makeup artist, I come across so many skin types in my work. A question I get asked frequently is, “what should i use for my sensitive skin”? Many of the people I know with sensitive skin usually use pharmaceutical brands, are afraid to try out new products, and still may struggle with the redness, dryness, skin irritation, dullness, spots amongst other complaints. Here’s a range of products that you can try if you have sensitive skin and whitening concerns – they’ve been tested and formulated for sensitive skin, and even those with normal skin will enjoy using them. I was invited to find out more about Vichy’s Whitening range of skincare for sensitive skin at a intimate sharing session with the lovely product managers of Vichy. Initially launched as Bi-White 12 years ago, and now into it’s fourth generation as Bi-White Med, March and April see the newly formulated day and night creams available alongside the Bi-White Med Deep Corrective Whitening Essence. This range of products have been tested specifically on asian sensitive skin, to target not only dark spots, but also to brighten dull complexion, yellow skin tone, smooth irregular skin texture, soothe red patches and combat dry patches. One of the things about most products for sensitive skin is that they’re usually fragrance-free and just do their work without much enjoyment of application, but many of us do love to use products that smell and feel lovely. To enhance the experience of using this range for you to desire to use it regularly, the products aim to be spa-like, with pleasurable textures and light fragrances. The day cream especially, has a light floral fragrance. When I used the essence and day cream together, it is instantly absorbed (less than 15seconds! ), leaves my skin feeling immediately soft and velvety, with a hint of fragrance that is soft and feminine. The day and night creams also harness the power of nature, from the Peony flower and five natural oils. Peony gives radiance and protects the skin from skin-damaging free radicals. The oils, Apricot, Passionflower, Macadamia, Coriander and Jojoba, give the cream antioxidant, hydrating, purifying, anti-inflammatory and reconstructive qualities. It’s worth to try it if you do like natural oils but have held off using them on your skin because of it’s sensitivity. For those in Singapore, you can get these products at the Vichy counters in Watsons, Guardian and Unity pharmacies. Watsons Ngee Ann City and Guardian Paragon also have the first Vichy flag-ship counters in Asia. To make your purchase even sweeter, you’ll get a special edition Parisienne umbrella when you purchase the Vichy Bi-White Med Essence together with the day or night cream..but only at select stores so ask them first! In my next post, find out what new makeup i’m diggin’ which is perfect for sensitive skin too! Tags: bi-white med, brightening, cream, essence, moisturiser, sensitive, skin care, vichy, whitening. Bookmark the permalink. It has fragrance in it?? There’s a natural floral fragrance from the oils in the product, but no added fragrances.